Yeah. You read right. This is for everything that doesn't have anything to do with Eva. Has anyone here taken the enneagram personality test? My result is a 4w5 and it is very much an accurate classification. I'm curious what other Eva fans would be classified as. I assume most would also be 4 or 5s, given the way Eva is and what people relate to it tend to be like, at least from what I've seen. Hmm, never seen this one before. Both forms of the test gave me the same result, which is mildly impressive in itself, and I came out as 9w1 (sexual variant), which seems not too far out as far as the descriptions go. Not remotely near your result, but then, I'm far from your usual Eva fan as well. Avatar: Such an angelic fascinator you're wearing, Shinji! (details); Past avatars. Interesting result. You're definitely not the average Eva (or anime) fan since you're in your 70s, but maybe my assumption is faulty. It's the official website for the Enneagram Institute. I would have linked to them in the OP but they want payment for their tests. The tests on the first website I linked are free, but might not be as accurate/extensive. I'm a 1w9. Do I win? You are most likely a type 1 or 5. It is not clear from these test results which Enneagram type and wing you are. To determine your true type, you might want to start by considering the types with the highest scores on the lists below. Also, there are many fine books and other websites that contain detailed descriptions of the types. Consulting these might give you the information you need to determine your true type. As knowing your Enneagram type involves self-knowledge, you might want to observe and analyze your behavior and motivations. You might also benefit from taking the test again later. 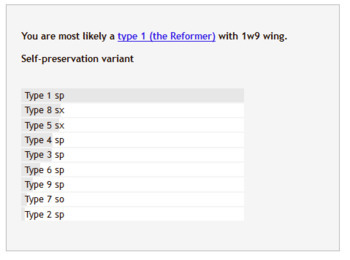 You are most likely a type 1 (the Reformer) with 1w9 wing. I got a 6w5 which seemed pretty accurate from what I've read on the website. 6 is the Loyalist. Bumper stickers from Night Vales chapter of the NRA. Guns don't kill people, people kill guns.